Penelope Skinner's drama focuses on a timely issue, that of the censoring of female voices and the rise and influence of social media. It focuses on a deeply religious society, where shame is currency and the patriarchy dominates. When Irene (Shvorne Marks) performs a protest song in a café, she is unaware of the fact someone has recorded it. The authorities hear it and she ends up incarcerated in a tiny cell. Then the clip starts to trend on YouTube and she becomes an accidental celebrity of sorts. Pious best friend Anna (Scarlett Brookes) provides little comfort, instead basking in the warm glow of their childhood friendship, and sitting in purse-lipped judgement on Irene's affair with a married man. A gorgeous, austere charcoal-marble set with a simple cross by Max Jones reinforces the sense of gnawing claustrophobia, but there are scenes which feel a little overwrought and too long, such as the dialogue towards the end which feels too expository. Still, the central performance by Marks is touching and thoughtful, and the central theme of technology as a symbol of both progressive and prohibitive action is pertinent, particularly as innocent words can be taken out of context. Traverse, until 26 Aug (not 13, 20) times vary, £20.50 (£15.50). 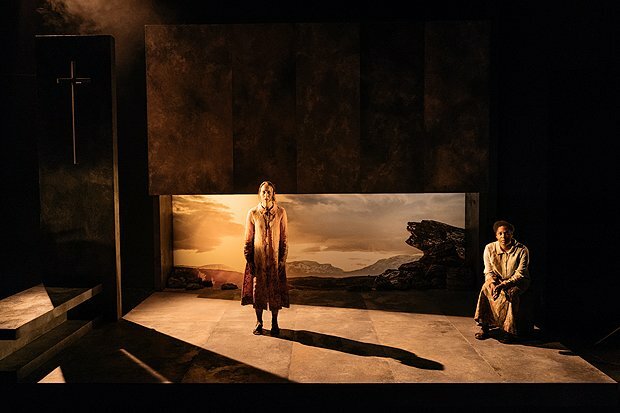 Headlong in association with Birmingham Repertory Theatre In a society where private lives become political and freedom of expression is not an option, Irene finds herself imprisoned. As tales of her incarceration spread overseas and her growing exposure becomes a threat, she is forced to make a brutal decision.